The name Shelix comes from SHEar and heLIX - SHELIX. The Shelix combines the advantages of shear & helix and spiral tooth action resulting in a smoother cleaner cut across the board. With the stagger tooth design there is no longer a need to replace a brand new straight blades if you happen to run a nail or hard knot through you planer. With the SHELIX design you just need to replace 1 or 2 inexpensive inserts. Want more information about the SHELIX? Go to our SHELIX page at this link here. 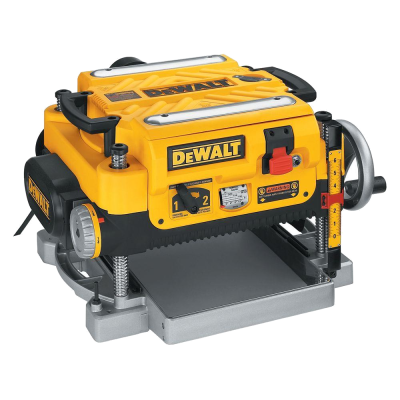 Why Should I Upgrade My DeWALT DW735? A large number of DW735 owners are taking their planer to the job site. You are typically on a schedule and downtime is simply not an option. Unlike traditional straight knife planer heads; the SHELIX has a stagger tooth design. What that means for you is less down time. When you knick a blade with a straight knife you either have to deal with it and sand out the line or replaces expensive knives. with the SHLEIX you just replace 1 or 2 inexpensive inserts. Oh yeah, you don't have to set the inserts either. They seat themselves. Tired of having to yell to the person standing next to you while planing or jointing a board? With the Shelix you won't have to yell anymore. Instead of having the entire length of head making one single cut, you have multiple cuts made the entire cutting circle which greatly decreases the amount of noise produced while cutting. Our is held to the highest standard when it comes to quality. During each step in production if the part does not meet that departments standard, it is either remachined on the spot or set aside as scrap. Your new will come with more than just your cutterhead. With all of our we send a few extra inserts. 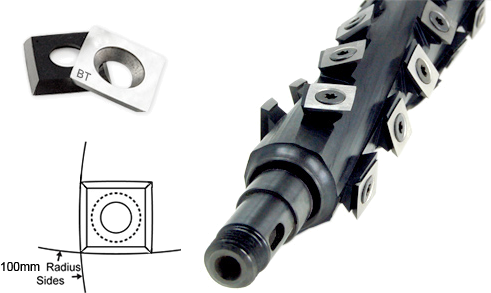 We also send a 1/4'' drive handle and Torx Bit so you are able to change your inserts. For the DW735 we also mount new bearings, this way you don't have to worry about removing your old ones and saving them. Just saves you the time and frustration. As always, we have free technical support if you have any questions with your new . All of our products manufactured at Byrd Tool come with a lifetime guarantee. If for some reason you products are not performing how you expected them to, LET US KNOW! We will work with you to find out what is going on. If it turns out it is our product, we will replace it or issue a refund, no questions asked! Here is a short video of the Pro's and Con's of Spiral Cutter heads (SHELIX). A big thanks to My Wood Cutters and Stumpy Nubs for letting us use their video! Have a Question or Just Need Help? 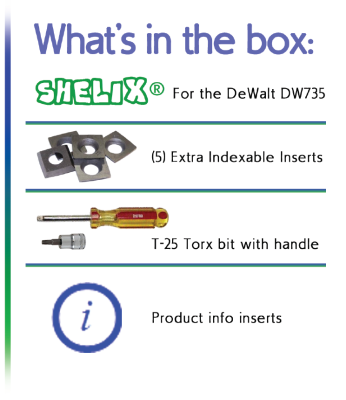 Need help installing your new 735 SHELIX? We are here when you need us (well at least 7am-4pm central time)!